After years of meditation and training, 18-year-old Obadiah Archer has been dispatched to New York City to carry out the sacred mission of his family’s sect – locate and kill the fun-loving, hard-drinking immortal known as Armstrong! But as this naive teenage assassin stalks his prey, he’ll soon find that both hunter and hunted are just pawns in a centuriesold conspiracy that stretches from the catacombs beneath Wall Street to the heights of the Himalayas. And Archer & Armstrong will have to work together if the future is to stand any chance of surviving the past’s greatest threat! No one in the Valiant Universe is more dangerous or more experienced in the art of war than the undying Eternal Warrior. After thousands of years on the battlefield, he’s a master of strategy and weaponry, an unrelenting force of nature capable of dismantling entire armies with little effort and less conscience. His brother Armstrong, on the other hand, likes to read poetry and drink beer. Maybe that’s why they had such a bad falling out? 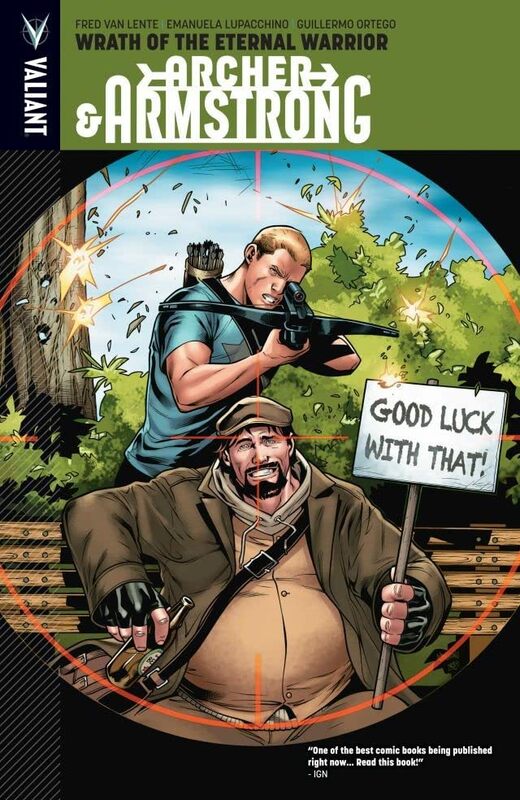 But now – after years apart – the Eternal Warrior has a new mission: destroy young Obadiah Archer, Armstrong’s best-est new buddy and teammate in the war against The Sect. And, like it or not, Valiant’s history-smashing adventure duo are about to feel the brunt of the Eternal Warrior’s fist and steel. 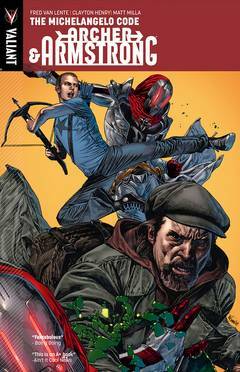 Collecting ARCHER & ARMSTRONG #5-9 by New York Times best-selling author Fred Van Lente (Amazing Spider-Man) and critically acclaimed artist Emanuela Lupacchino (X-Factor), the second volume of the series that IGN calls “hilarious and action packed” slams into high gear with a savage manhunt straight through the heart of the Valiant Universe.